What the heck are Robert Mueller and Donald Trump “negotiating” tonight? 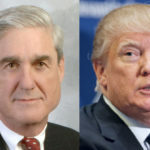 Over the past week, Donald Trump has gotten his backside handed to him by Special Counsel Robert Mueller in a number of ways. Mueller got Trump to submit his written answers before letting on that he knew Trump was coordinating stories with Paul Manafort. Mueller used Michael Cohen to expose Trump Tower Moscow, and used Michael Flynn to send everyone in Trump world scrambling. Now it’s suddenly being reported tonight by NBC News that Mueller and Trump are “negotiating” things. Wait, negotiating what? Donald Trump already decided that he was only willing to answer Robert Mueller’s questions in writing, and he’s now submitted them. If that infamous secret court battle is indeed over whether Trump has to come testify in person, that’ll be decided by the court, meaning there’s nothing for Trump and Mueller to discuss about it in the meantime. That leaves us to conclude that they’re instead “negotiating” something about the written answers that Trump turned in. The big question is why Donald Trump would now be willing to negotiate this. He already decided what he was willing to say in his written answers, and he was clearly uninterested in providing any additional information beyond those answers. So even if Robert Mueller has predictably come back and asked him for additional information or followup answers, it’s noteworthy that Trump is playing ball with him on this. Considering the manner in which Rudy Giuliani is suddenly trying to distance himself from the entire Trump legal team debacle, we’re not even sure who’s running Donald Trump’s defense at this point. But it sure looks like Mueller found something in Trump’s answers that gave him the kind of leverage that’s convinced Trump to resume negotiating with him. Stay tuned, because there’s probably a lot more to this.